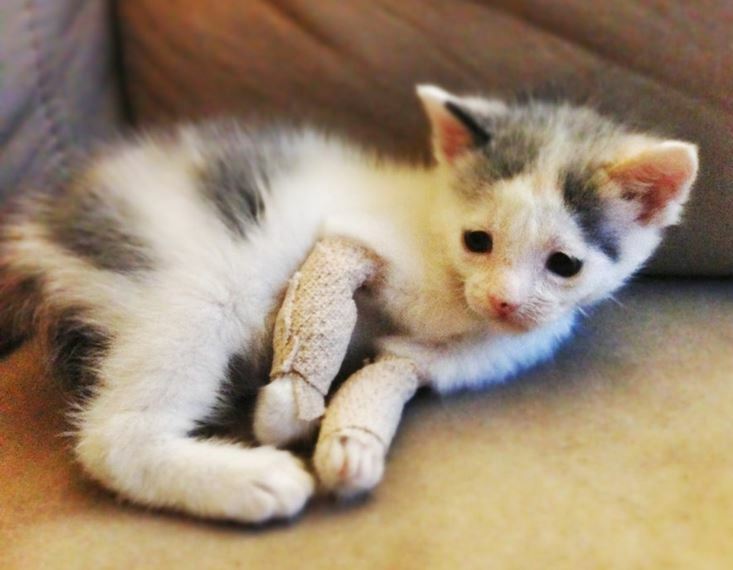 Saltwater Taffy is a young kitten whose front legs are bent due to a congenital condition. 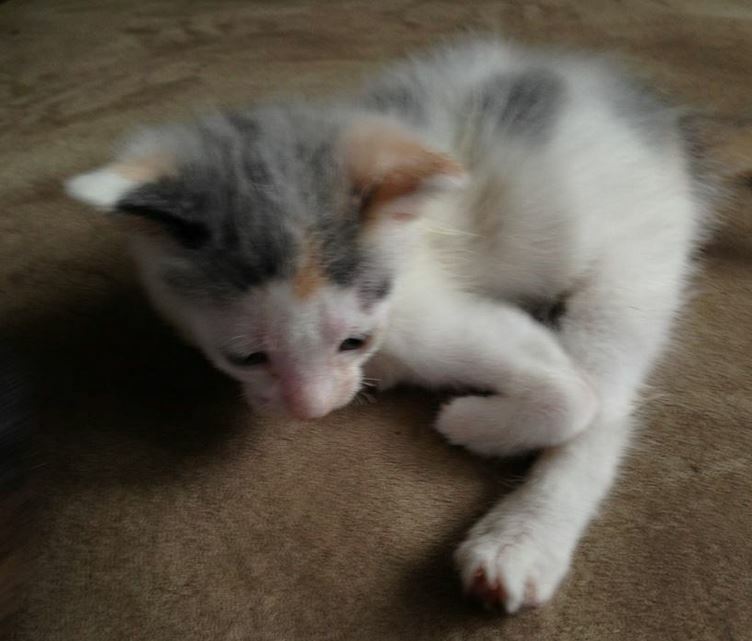 She was found in a back yard in Philadelphia, along with her siblings, who are also special needs, and is being fostered for ACCT. 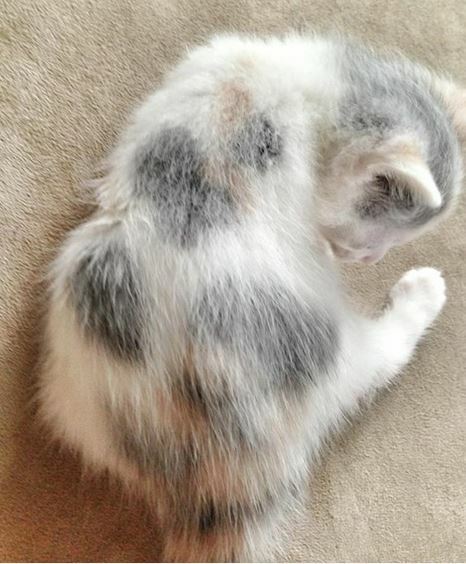 Saltwayer Taffy is a young bendy legged kitten who appears to have radial agenesis. Her bent legs are from a congenital condition. She was found in a back yard in Philadelphia, along with her siblings, who are also special needs, with facial abnormalities. All the kittens were saved and are being fostered for ACCT, the Philly Animal Care and Control Team. Meet Saltwater Taffy, the Lobster Claw Kitty. 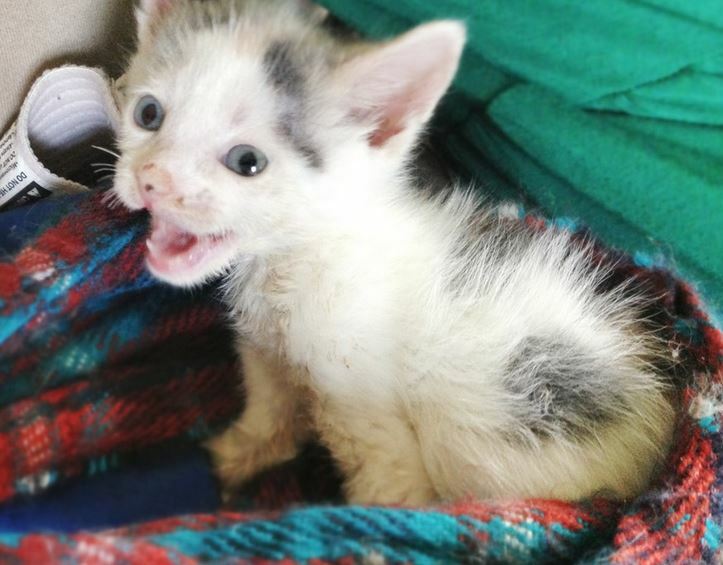 This baby was picked up from a back yard in Philadelphia in the dark of night. The shelter noticed right away that there was something very different about this five week old kitten (besides the fact that she was still alive): SHE HAD LITTLE LOBSTER CLAW LEGS. Her front legs make an “L” shape. The shelter vets thinks that her special legs are probably in this shape because she has tendon contracture and maybe missing radial bones. Because she is still a baby monkey, she doesn’t get around too great yet. She kind of flops around because her front legs aren’t very strong. She manages to get herself to her food bowl for noms (excellent job!) 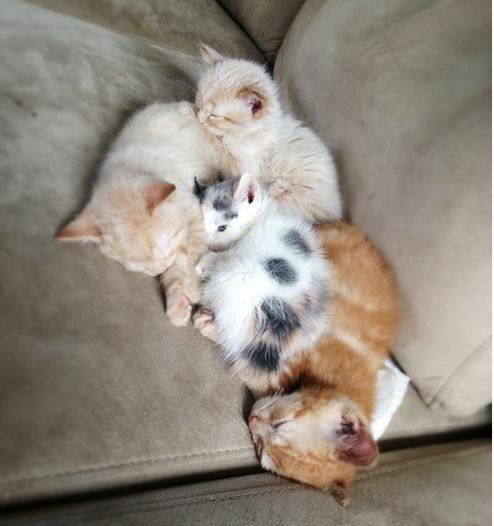 and pushes herself into a pile to lay with her two siblings. Oh, did I forget to mention that Salt Water Taffy isn’t the only kitten in the family with some level of special? She wasn’t picked up by herself, oh no siree…she has two fuzzy siblings with their own “specialness”: wonky noseholes! They are shaped funny…one has crooked noseholes, one has extra gooby skin in the nosehole and they are crazy adorable, just like Saltwater Taffy!! Their names are Caramel Cornelius and Rudy Beer Float. 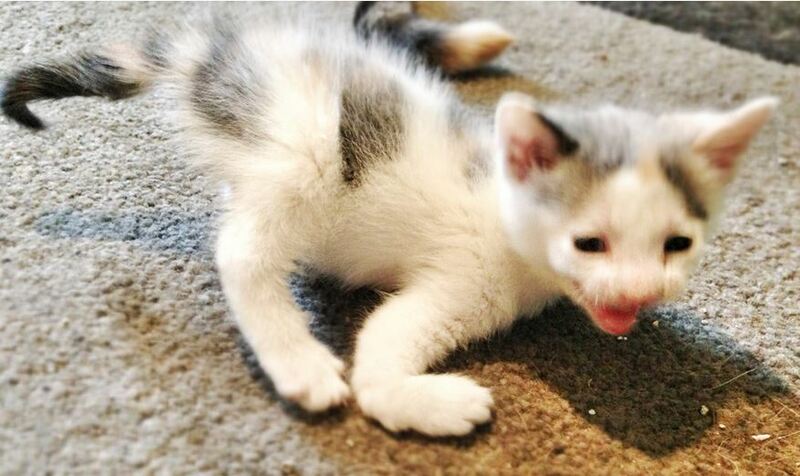 So what does all of this specialness mean for a kitten who can’t walk because her front legs are bent and wonky? Well, her prognosis is guarded. The good news is that aside from her lobster claws, she seems to be in pretty good health and she has already made it this far. 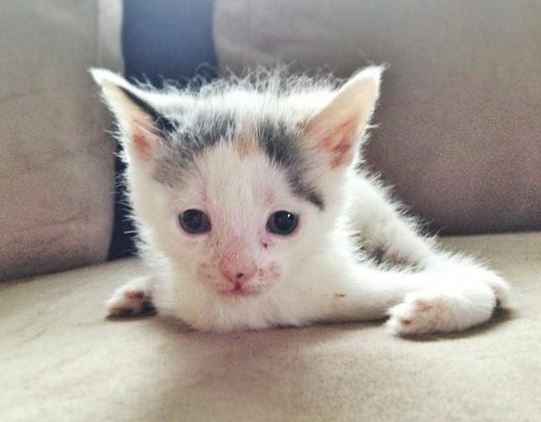 Her foster mom isn’t sure if Saltwater Taffy will ever be able to walk normally. Maybe she will be like those cats who walk on their elbows! Hey, we have seen lots of special needs animals defy odds, haven’t we? 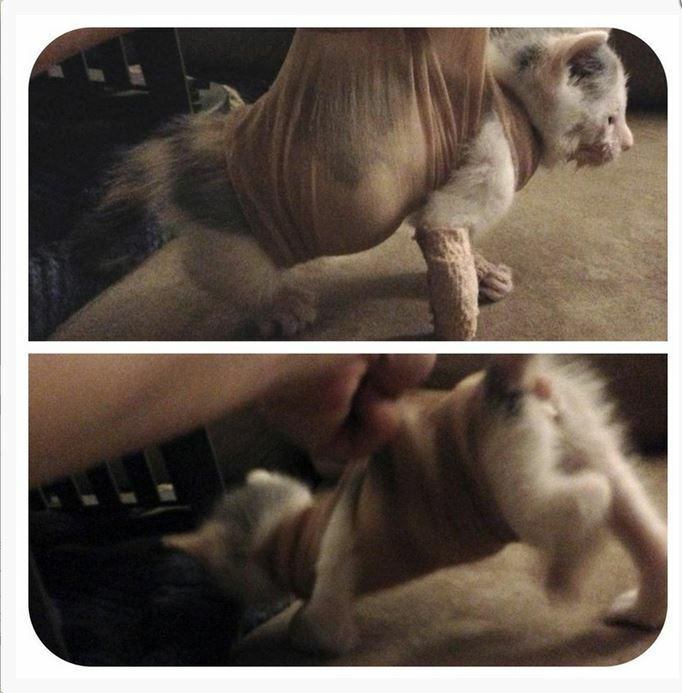 For the moment, SWT’s foster mom has fashioned a sling out of some stockings to help her “walk” and get stronger (foster moms are crazy resourceful, you know. Foster moms (and dads) sometimes have to get real creative in order to help their foster kids have the best chance at a “normal” life (whatever that really means..haha!). She kinda hates this physical therapy…she walks in circles out of spite until her foster mom puts her down and then she flops over to her foster mom’s feet and screams to get picked up. She is pretty sassy, which allows her to thrive! ALegs for Taffy at YouCaring.com page has nearly met its very modest $500 goal. This $500 is for new x-rays and diagnostics, one step in Taffy’s treatment journey. For more on Taffy, for new pics, and for continued updates, you can visit and ‘like’ her Saltwater Taffy, the lobster-claw kitty Facebook page.